Mine: The setting is kind of stupid (the 80's world of mergers), but the story is told with a great deal of flair. Melanie is really good here, and almost never is again. Harrison is great as always. A sweet charming story. Weaver is fun to watch as the villain. 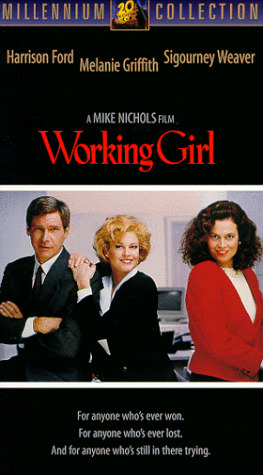 Leonard Maltin/Plot synopsis: Cute comedy about a naive but ambitious secretary who tries to outfox her wily boss by closing a big deal--with the help of a man she just happens to fall in love with. Star-making showcase for Griffith also gives Ford an ideal opportunity to play light comedy, and Weaver a sly supporting role as the villainess. Carly Simon's music was scored by Rob Mounsey; her song ``Let the River Run'' won an Oscar. Later a TV series.